▪ A free burrito is available at fast-food chain El Pollo Loco on National Burrito Day, Thursday, April 4. You must first buy a burrito of equal or lesser value, and show or print a coupon from the restaurant’s website. ▪ A free burrito is also available Thursday, April 4 from Cristal Bakery & Restaurant at 704 O St. in Sanger. Customers must buy one burrito to get another one free. ▪ A free confetti bundtlet (a cake the size of a large cupcake) will be given away at the Nothing Bundt Cakes bakery, at Herndon and Willow avenues, Tuesday, April 9. The company is celebrating the opening of its 300th store and giving away up to 300 of the little cakes. But check out this fine print: Nothing Bundt Cakes is only giving away the bundtlets for 300 seconds. That’s five minutes, starting at 3 p.m. local time and ending at 3:05 p.m. Limit one per person. No coupon needed. ▪ A free veggie or turkey dog is available on Monday, April 15 at Hot Dog on a Stick locations. It’s a tax-day deal that doesn’t need a coupon or proof of having done your taxes. One per customer. ▪ Free shaved ice will be available from the Kona Ice truck in Fresno from noon to 2 p.m. Monday, April 15. It’s part of the company’s national “Chill out” day. The truck will be parked at Fresno First Bank, 7690 N. Palm Ave.
▪ Romano’s Macaroni Grill is offering a free slice of pumpkin cheesecake Monday with the purchase of an entree. The deal applies to both dine-in and take-out orders. 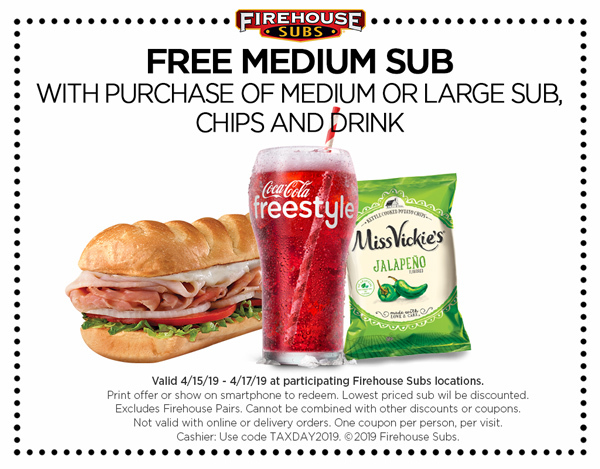 ▪ A free medium sub from Firehouse Subs will be available between Monday, April 15, and Wednesday, April 17, as part of a tax-time deal. Customers must purchase a medium or large sub, chips and a drink to get the free sub. Print or show the coupon from the restaurant’s website.